Our Most Revered Gurudeva, Nityalila Pravishta Om Vishnupada Sri Srimad Bhakti Dayita Madhava Gosvami Maharaja, Founder/President of Sri Caitanya Gaudiya Math institution, established this Calcutta Math, and his objects of worship, Sri Sri Guru-Gauranga-Radha-Nayananatha Jiu, appeared here by dint of his devotion. He installed the Deities during the winter season. Thereafter, our Gurudeva introduced two five-day religious meetings in the Calcutta Math, to celebrate the occasions of the anniversary of the installation of the Deities and Sri Krishna Janmashtami, the advent anniversary of Sri Krishna. At that time, when he was living on this earth, we were under him directly, so we had no worries. Whatever he directed was directed by Supreme Lord Sri Krishna. Gurudeva is the absolute counterpart of the Supreme Lord, and we were not to be worried. But, after his disappearance, we could not see him physically although, indirectly, he was still directing everything. As God is eternal, His absolute counterpart is also eternal. As long as there is the sun, the light of the sun, the quality of the sun will also be there. If the sun is eternal, its light will also be eternal. Like that, the Supreme Lord is the Supreme Eternal Entity and, therefore, His absolute counterpart is also eternal. He is grace incarnate. He graces all the deserving enslaved jivas of this world. By the grace of the Supreme Lord, we can see that His grace incarnate is the bona fide guru, His personal associate. Gurudeva, the grace incarnate of Supreme Lord Sri Krishna Gauraìga Mahaprabhu, appeared and put his holy footprints in our own place. I had no knowledge of Gaudiya Math, but he attracted me. He is the expansion of Caitanya Mahaprabhu. Caitanya Mahaprabhu sent His own personal associate here. Gurudeva also went to many different places and rescued many fallen souls. We have to remember Gurudeva. Without his grace, without submission to him, without sincere belief in him, we cannot have any kind of contact with Krishna. There are infinite brahmandas and infinite planets—so many that we cannot even conceive of them. Somewhere within these brahmandas, He is appearing continuously. So, in this sense, His appearance is eternal. But He also appears, reveals Himself, in the sanctified heart of the suddha bhakta. This is also His eternal appearance. We have to prepare ourselves so that Krishna will think us to be qualified to get Him. Then He will appear in our hearts. Today is the day before Janmashtami—"adhivasa". "Adhivasa" means that we have some prior duty to perform before His appearance, so that we will be ready for Him. We have to sanctify our hearts so that Krishna can appear there. Krishna is already there, but we are not aware of His presence. Supreme Lord Sri Caitanya Mahaprabhu wrote this verse thereby instructing us how to attain the association of Krishna. How can Krishna appear in us? What do we have to do? "Sri-krishna-sankirtanam": chant the Holy Names of Sri-Krishna. Then you will get everything. "You do not need to do anything to purify your mind, except to go on chanting `Radha-Krishna', Hare Krishna mahamantra. Everything will come to you." We say this repeatedly with our words but, in practice, we have no belief. The Supreme Lord will descend into our hearts—will be revealed in our hearts—when we actually and sincerely take absolute shelter at His lotus feet. He will reveal Himself to the surrendered soul. If we chant with bonafide submission, we will find that everything is there in the Holy Name—Form, Attributes, everything. The Name is saccidananda. Krishna is saccidananda. This realization will descend into our hearts. We might think that we will get Him by our own capacity, but He is not subservient to us. He is Self-effulgent, Self-luminous like the sun. Svami Maharaja (Srila A. C. Bhaktivedanta Svami Maharaja) used to say, "If one is enlightened by that knowledge by which ignorance is destroyed, then that knowledge reveals everything, just as the sun illuminates everything at daybreak." When the sun rises, he shows himself and everything else in proper perspective. We think harinama to be material sound and that we can get Krishna by our own capacity. No! If we submit to God and His absolute counterpart, then all will be revealed. We cannot bribe the Supreme Lord. Everything is within Him, there is nothing outside Him. Dhruva Maharaja received the grace of the Supreme Lord. We are uttering the Name and we are not getting this grace. Why? "He is not gracing us!" we complain. No, no. The sun is giving light to all. It is shining in the filthy place, the clean place—everywhere. Some are taking advantage of it, but the majority is not. Nonetheless, we complain, "The sun is not blessing us." Dhruva had firm belief. His faith was without a trace of doubt. "My mother told me that, by crying the Name of Sri Hari, I shall get Sri Hari." He was crying, crying, crying continuously. We are not doing this. He was continuously uttering the Holy Name, completely absorbed in Hari and, whatever he saw, whether a lion, crocodile or any other beast, he embraced. They did no harm to him as he was protected from all danger. However, we have difficulty believing this. Ultimately, he received the grace of Narada Gosvami. That was an example from Srimad Bhagavatam but, in this Kali-yuga, when we were once in Punjab, a very astounding event took place. A devotee woman was traveling by rickshaw from her shop to a remote place, about two miles away. She was wearing many gold ornaments. She traveled for some time along the well-populated road when suddenly the rickshaw driver turned away from the main road, toward a field. "Why are you going across this field?" the lady protested. "That is the way, over there." "No," the rickshaw driver said, "I am taking a shortcut. We will go this way." He would not heed the woman's words. Then, the woman became afraid, thinking, "I am wearing so many golden ornaments. The driver must be greedy for them. He will rob me and kill me." For this reason, she jumped from the rickshaw and started to run away, shouting, "Hah Govinda! Hah Govinda!" This is fact. We were there at the time. To save herself, she jumped into a well. In terror, she remained in the well throughout the night, all the time uttering, "Hah Govinda!" At dawn, the next morning, many people from the village came for their morning walk. They heard the sound of a woman's voice uttering the Holy Name. "What is this?" they asked. They followed the voice to the well and found the woman who was crying, "Hah Govinda! Hah Govinda!" An extremely poisonous snake was swimming around her, circling her. "What is this?" they wondered. Then, they saw the rickshaw. A man holding a dagger lay next to it—dead. A great cry rose from the crowd and many people gathered from different places to see what had happened. By now, it was daylight and, as people came to the woman's aid, the snake left. All the witnesses at the scene said they had never seen that snake before and, since that time, they have never seen it again. When the rickshaw driver went to kill the woman with his dagger, the snake bit him and injected him with venom, killing him instantly. After that, the same snake protected the woman throughout the night by circling her, so that no one could come near. The woman had firm belief. She did not utter any other name, only, "Govinda! Govinda! Govinda!" Even in this Kali-yuga, you can find such an event. Therefore, you should have belief. Janmashtami and other auspicious functions at the Math are "hari-smarana-mahotsava" (grand celebrations dedicated to the remembrance of Hari). You will find, in a certain hymn, that the entire purpose of performing bhajana is to remember Krishna. We shall destroy all evil thoughts by remembering Krishna. We shall get everything by remembering. But, it is said in the scripture called Vaishnava Cintamani, that it is not easy to remember, to meditate, with this material mind. It is very difficult. All the sins, vices and evil thoughts will be destroyed by remembrance of Krishna, but it is not so easy. But we can remember Krishna if we utilize our lips to utter His Name. By moving these lips, we can obtain eternal benefit, but, unfortunately, we have no aptitude for this. We cannot remember Krishna by means of the material mind. When we are able to remember Krishna by loudly and continuously performing harinama, and that remembrance is revealed in our hearts, then we will be entitled to perform bhajana in a secluded place, but not now. Sri Caitanya Mahaprabhu is teaching us. Our Bhaktisiddhanta Sarasvati Thakura is teaching us. If our Gurudeva ever saw some devotees dancing and chanting the Holy Name, he would show them great respect. "They are expressing their hearts! Hari bol!" In order to gain some respect, name and fame, I was also dancing. "Ah! Very good!" Gurudeva would say. He would be pleased with me, although I was doing it to receive praise. Inside, I had no feeling, no want for Krishna, and no perturbation of heart. I did it only to get respect from others. Nonetheless, Gurudeva was so satisfied. Why? This you have to understand. "Kirtana prabhave smarana haibe" (Srila Bhakti Siddhanta Sarasvati Thakura). Remembrance of Bhagavan comes from constant chanting of the Holy Name. Prahalada told all the demon boys, "Why are you afraid? There is no difficulty in worshipping Krishna. You should just utter the Name. You are calling your father and your mother without difficulty. Call Him and He will be satisfied. There is no difficulty. He is within you. He has affection for you. You will find the affection of crores of mothers in Sri Hari." Here in this world, one always encounters difficulty when trying to please another person, but Krishna is not at all difficult to please. With a sincere heart, utter His Name. In your household life, you wile away the time for nothing, for worldly things. If you are also gossiping about these things here in the temple, then why have you come? The temple is for the worship of Krishna, nothing else. You should think about this. Why have you come here? Have you spent so much money to come here only to gossip about worldly things? Once, our Guru Maharaja was in Vraja-mandala performing parikrama. Generally, our Guru Maharaja would remain in front to perform kirtana, guiding the other devotees. On this particular occasion, Guru Maharaja was held up with work at some place and would not be able to come until later. At the front of the procession, all the Vaishnavas were chanting the Holy Name and the others were answering him back. But, at the back of the procession, there were so many devotees who were idly gossiping about worldly things. They did not know that Guru Maharaja was coming up from the rear. When Guru Maharaja came up to them, he said, "Oh! Your whole life's fortune has been destroyed! At this great procession you are also gossiping about worldly things? Then they quickly started chanting, "Radhe Govinda! Radhe Govinda!" What is the reason why we have spent so much money to come and be here? Is it to give our energy to worldly things? If we hear about Krishna, we shall go to Krishna. If we hear about worldly things, we shall go to worldly things. If we sing about Krishna, we shall go to Krishna. If we speak about Krishna, we shall go to Krishna. If we remember Krishna, our minds will go there. If we devote all our sense organs for the service of Sri Krishna, we shall go to Him. This is called bhajana. If we go on expending all our energy for worldly things, while remaining externally in the Math, what benefit will we receive? Tomorrow, Krishna will appear. He will appear in the shrine of our hearts. He is there within us and He will appear there. So, today, on this adhivasa tithi, we have to clear the heart and mind so that Krishna will come and sit there. Krishna does not take His seat in an impure, dirty place. Krishna is the Holiest. We have to prepare our hearts, purify our hearts. There should be no desire other than the service of Sri Krishna. If there should be any other desire, then that heart is impure. As long as impure thoughts are there, Krishna will not appear. In Purushottama-dhama (Puri), during the time of the car festival (Ratha-yatra), Lord Jagannatha travels from His temple in Puri to the Gundica Temple, a distance of about two miles. Caitanya Mahaprabhu explains that the Gundica Temple is Vrindavana and the Jagannatha Temple is Kurukshetra. During a solar eclipse, people go to Kurukshetra to bathe and perform other rituals. In the scriptures, you will find descriptions of the immense glories of this practice. During the time of Krishna's pastimes on Earth, there was a solar eclipse where Krishna came from Dvaraka to Kurukshetra with all His personal associates. At that time, Krishna was the King, Emperor and Sole Proprietor of Dvaraka. All His subjects, consorts and personal associates were very eager to go to Kurukshetra during the solar eclipse so they could bathe, perform sandhya and other rituals. If they could perform these sacrifices with the brahmanas, they could get immense fruits. To fulfill this desire of His subjects, Krishna said, "All right, we shall go." So, all the numerous subjects, consorts and personal associates came to Kurukshetra. Krishna intentionally invited everyone except the Vrajavasis—the devotees of Vraja. Narada Gosvami was very shocked by this. He approached Krishna, saying, "The Vrajavasis love You so much. They are experiencing extreme separation grief by not seeing You. You are inviting everyone in the whole world but You are not inviting the Vrajavasis? What offense are they guilty of? Have they committed an offense by loving You? I cannot tolerate this!" Then Krishna said, "They are our own people. No one has to send invitations to one's own. Parents do not invite their children, and vice versa. They are our own. Outside people are invited. How can I invite the Vrajavasis? You are right, I intentionally did not invite them because they are saturated with love for Me. They have no interest in performing sacrifices to obtain mundane benefits. If they come, the results of all these ritual practices will be destroyed. For this reason, I have not invited them." Although not invited, the Vrajavasis came to learn that Krishna was coming to Kurukshetra. The Vrajavasis thought, "Kurukshetra is much closer to Vraja-mandala than Dvaraka is. We should avail ourselves of this rare opportunity to see Krishna! We can have darsana of Krishna! We should not miss this chance!" But they could not venture to go there. Why? They thought, "Krishna has become the Emperor. His standard is very high, and we are merely cowherd men and women. We are poor people. Perhaps Krishna has forgotten us. If we go there, He will not recognize us. Someone of such a high position will not come to see ordinary people like us. Previously He was a cowherd boy in our Vraja-dhama, but now He has become King. But we are extremely grief-stricken. We cannot tolerate this separation." Thinking like this, the Vrajavasis reasoned, "A man might forget everything else, but he will never forget his parents, even if they live far away. If Nanda Maharaja and Yasoda go there, then Krishna will bow down to them and make obeisances." So they went to Nanda Maharaja, saying, "Krishna is coming to Kurukshetra! We are too grief-stricken with separation grief. We have not seen Him for such a long time, but we do not have the courage to go there. We do not know if Krishna will give us the opportunity to see Him, as His present standard of living is so high. 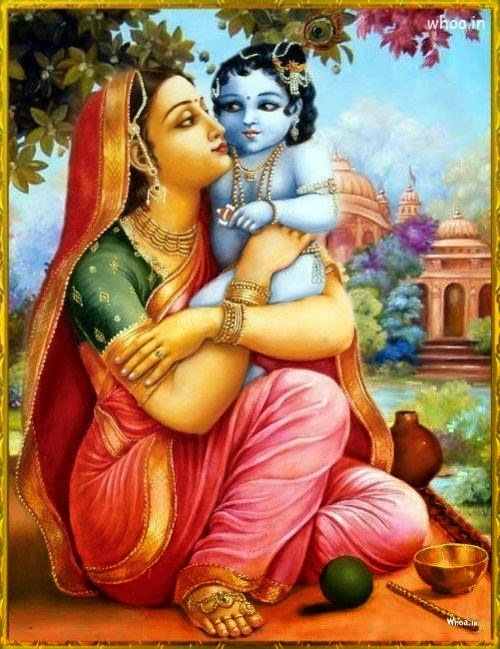 But, if His parents go there, then Krishna will come to them as their son and offer obeisances." Then Nanda Maharaja and Yasoda said, "No, no. This is not correct. He has not come here for such a long time! He has so many consorts and servants serving Him there. He is so wealthy now. His wives are also wealthy. We are only cowherd men and women. We have nothing. After so long, how can we go? If we go there, will He come to see us? If we go to Kurukshetra and are deprived of seeing Krishna, we shall die!" When Krishna, the Emperor of Dvaraka, entered Kurukshetra, so many cavalry units, elephants, horses, etc. accompanied Him. Only those who had permission were allowed to go to speak with Him. He was surrounded by servants. There were four gatekeepers, one in each direction. The King's parents, Vasudeva and Devaki were also there. The brahmanas had gone to start the sacrifices. So, no one was permitted to disturb the King. Nanda Maharaja, Yasoda Devi and all the cowherd boys and other friends of Krishna approached where He was. Nobody acknowledged them. Armed forces, cavalry and elephants surrounded Krishna. Nanda Maharaja approached one of the guards. "I have come to see my beloved son," he said. "Who is your beloved son?" a guard asked him. "How is that? You are a poor person. He is the King! His parents are already here—Vasudeva and Devaki. We do not believe you! From where have you come? Why are you claiming that He is your son? We do not believe you!" Nanda Maharaja cried, "I shall die!" The guard said, "I am doing my work as per the order of the King. If I do anything against His orders, I shall be dismissed. Do you have a permit?" "Then I cannot let you in," the guard replied. Then all the cowherd boys, carrying their small cow prods, cried, "My friend! My bosom friend! Kanhaiya!" "What? He is the King! His friends are like this? You are paupers! I do not believe you!" Then the gopis cried, "We are the consorts of Krishna!" "What? The consorts are already here. Satyabhama, Rukmini and all the other queens are here! From where have you come? Show me some permit from the King or His Prime Minister!" Then, Yasoda Devi said, "I told you that, if I go to Kurukshetra and I am deprived of seeing Krishna, I shall die! I have nothing left. My life is finished!" She cried loudly, "Gopala!" and fell unconscious. At that time, Krishna was with the brahmanas, who requested Him to start the sacrifice. Krishna removed all His royal garments and became a small, naked boy, crying, "Mother! O Mommy! Mommy! Mommy!" He cried and cried and cried and ran to sit on the lap of Yasoda Devi. Now, without Krishna's presence, all the ritual sacrifices were destroyed. By hearing one single call from Yasoda Devi, Krishna could not remain there. Then Krishna met the gopis and the others. The gopis attracted Krishna. They said, "We are not very happy seeing You here. There are so many cavalrymen, elephants and chariots—we should go to Vrindavana. There, it is sweet. All this is Your majestic aspect. So, please allow us the opportunity to see You in better circumstances by coming with us to Vrindavana. Please do not remain here! "He Gopinatha! He Gopinatha! Vrindavane calo! He Gopinatha!" In that mood of the gopis, saturated with gopi-bhava, Caitanya Mahaprabhu pulled the chariot from the Jagannatha Temple (Kurukshetra) toward Gundica (Vrindavana). During the chariot festival, Krishna, Baladeva and Subhadra make the trip in three chariots. The day before the festival, Caitanya Mahaprabhu told the devotees, "You see, Krishna will come to the Gundica Temple tomorrow. You must come with Me and cleanse the temple." "Cleansing the temple" means that you must remove all the thorns and rubbish outside and trim the grass. You must clear the path of any stones and sweep away all the dust with a broom. But it also means that you are to engage your sense organs for the service of Krishna. If you do not engage your sense organs for Him, you will not get Him. For this reason, you have to clear your heart of all desire for the attainment of material benefits, both here and in the hereafter, in heaven. If such desire is there, Krishna will not come. The desire for non-eternal benefits and emancipation, the desire to merge yourself in formless Brahman, the desire to merge yourself in Paramatma, these sorts of desires will deter you from going to Krishna. Krishna will not come to you. For this reason, you have to clear all of this away—these desires are like hard stones. Outside, you clear them away with brooms, and all the devotees bring earthen pots full of water to wash everything. After this, there should be no desire for name and fame and other such things. All of this should be totally removed. For this reason, Caitanya Mahaprabhu, with the help of His own uttri (the cloth that a sannyasi wears around his neck), scrubbed the inside of the temple. There should not be any kind of material desires within the heart, not even those hidden secretly. Then Krishna will come tomorrow. Krishna is coming here from the Jagannatha Temple, and you have to clear these unwanted things away. This means that you have to clear your mind. There should be no other desire except desire for Krishna. Krishna is coming to Vrindavana. Krishna is the only Autocrat there. No other ideas, forces or persons should dominate your heart, except Krishna. So, you have to make your heart the same as Vrindavana, where Krishna is solely dominant. He is the Sole Proprietor. Caitanya Mahaprabhu says, "I have made this mind Vrindavana, so that Krishna will be free—free to perform all His pastimes and sporting activities." You have to make your mind Vrindavana. No one else should be allowed to enter, and no other thoughts should be allowed. Now you are staying in a room and outside you have placed a big sign that says, "Welcome." So, others see the sign and say, "Oh, welcome," and they come to your door. But the door is closed and, behind the door, there are many chairs, tables etc. In fact, the room is completely filled with furniture! They cannot even open the door. So, they go away, disappointed. Outside, your sign says, "Welcome," and you are thinking that you are welcoming Krishna. But, when Krishna comes, you have thoughts in your mind of wife, children, house, money, name, fame and other things. All these things have filled up your heart. Krishna will come and then go back. You have to clear your mind, your heart, for Him. Clear away all attachment to non-eternal things. Then Krishna will come tomorrow. We have to perform harinama. This is the best method. So, in these days leading up to the advent of Sri Krishna, we should perform harinama saìkirtana. We should not do this to show off to others. We have to do our own bhajana. We must call and call Krishna from the core of the heart. The days should be spent performing sankirtana. Then our minds will be cleansed and Krishna may appear. If you want Krishna, you have to remove all things that are not Krishna. This is "adhivasa". Caitanya Mahaprabhu has taught us that you will get everything, all kinds of attainments, by means of the Holy Name. He made all the devotees chant the Holy Name, being careful to avoid the tenfold offenses. You are not to engage in meditation or any other kind of practice. Your mind will be cleansed. All the unwanted desires will be removed: "ceto darpana marjanam". You have multifarious desires but, if you perform sankirtana, the first attainment is that your desires will be removed. When these desires are gone, so too will be the pangs of threefold suffering—miseries. The desires are the miseries. As long as you have desires, should there be some hindrance to the fulfillment of these desires, your mind will become upset. For this reason, when the desires are removed, there will be no afflictions and Krishna will appear. Krishna is All-Good. After that, you will have a relationship with Krishna, thinking, "I am of Krishna." With love, you will utter the Holy Name and you will be drowned in the ocean of ambrosia—bliss—and, at every step, you will have the taste of that sweet transcendental ambrosia of the Supreme Lord.